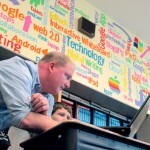 Quick Look: Does the Flipped Classroom Work for Every Teacher? Interesting criticism about sending kids to watch videos at home: “Some teachers use the textbook well as a supplement to their class, and then other teachers use the textbook as a driving force to their class, which is usually pretty disastrous,” says Noschese, a physics teacher. He says if teachers want to engage kids in class, they should be thinking of activities to eliminate traditional classroom lectures altogether. As long as there have been teachers, they've battled the same problems: How can they reach students of multiple ability levels at once, cover more course material in limited time, and find more time to engage with students one-on-one? Some educators think they've found a solution to all three problems in, of all things, YouTube.